Lami is a delicious WordPress theme for those who love blogging about recipes and cooking. Lami comes with a recipe plugin that can help you to post your favourite recipes on the fly. Upload recipe images, include ingredients, set rating, set for how many you want to cook and much more features. Customize Lami with a native WordPress customizer, change colors, show/hide elements, change fonts etc. Stay connected with your readers with a MailChimp newsletter and Contact Form 7. Show your best recipes from your Instagram. Lami WordPress theme comes with a grid and list posts layouts. Do you love cooking and recipes? Then this theme is for you. 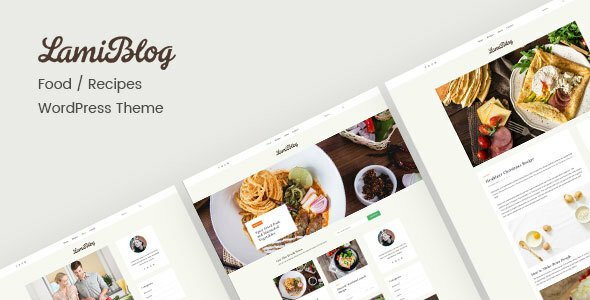 Start your tasty blog with a Lami WordPress theme.